You can use many different techniques in guitar playing; they all add effect and tonal quality to your guitar style. They make you a better player. They make you sound better. However, just these techniques on their own don’t constitute a truly unique and brilliant guitar technique. 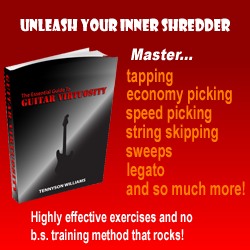 The use of hybrid techniques can make the difference between good guitar players, and great guitar players! This is basically an E minor stretch legato phrase followed by an A minor arpeggio with notes from the A Phrygian dominant scale thrown in, the combination of these notes creates a great dissonant almost eastern sound! The most important thing to take away from this lesson is the fact that you can make these hybrids and it will help your style tremendously!